My kids just love meals where they can be involved and build their own dinner creation. This meal allows them to do just that. I made a huge pot of my favorite chili, assembled all kinds of delicious toppings, made a platter of tasty hot dogs with fresh buns and let the fun begin! It’s not only a fabulous weeknight meal for kids, but it can also be a perfect party food. Everyone has a favorite chili recipe, and they usually vary from one recipe to another. My favorite recipe is a concoction of ground beef, onions, kidney beans and diced tomatoes, with tomato soup for the base and lots of chili powder. Yum. Put your chili in a pretty bowl that will be perfect for self-serving. 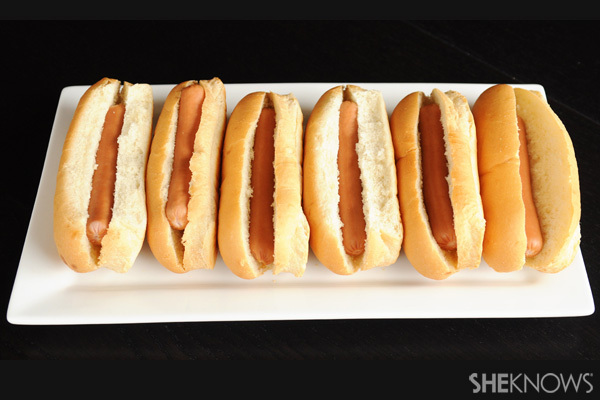 Next, cook up a pot of hot dogs, and slice up some fresh buns. I put my hot dogs on a platter, and the kids were able to help themselves! Now, on to the toppings! The choice for toppings is endless. I tried to incorporate a variety of food groups to allow the kids to make some healthier choices. 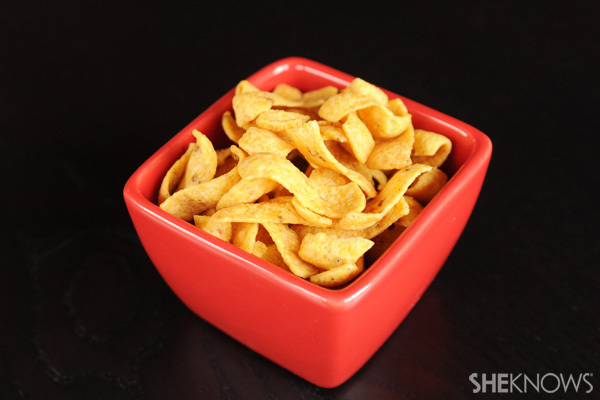 I also threw in a couple fun choices too — like corn chips and shredded cheese. My kids thought they hit the jackpot by having chips as a topping for dinner! 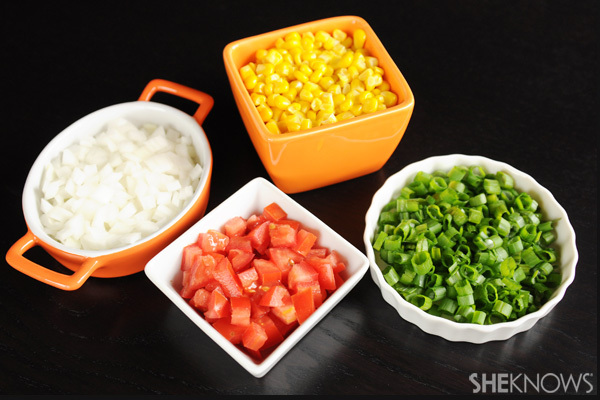 First up are some fresh, healthy choices — fresh sweet corn, chopped green onion, diced white onion and diced tomato. You could alternately serve salsa instead of the diced tomato. Next up, some yummy dairy toppings. 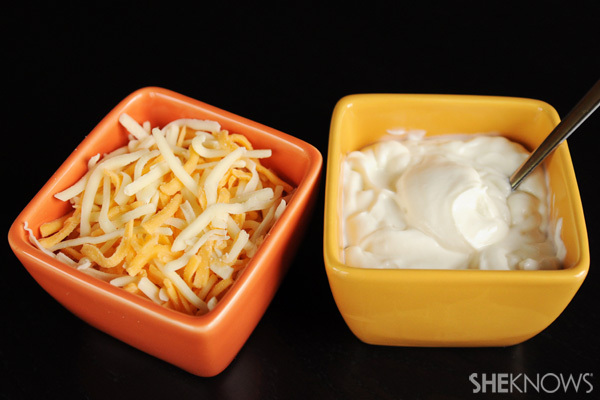 Who doesn’t love some fresh, shredded cheese and sour cream with their chili? Delicious and nutritious. Finally, some yummy corn chips. These give the chili dogs a great crunch, and the kids just love them! 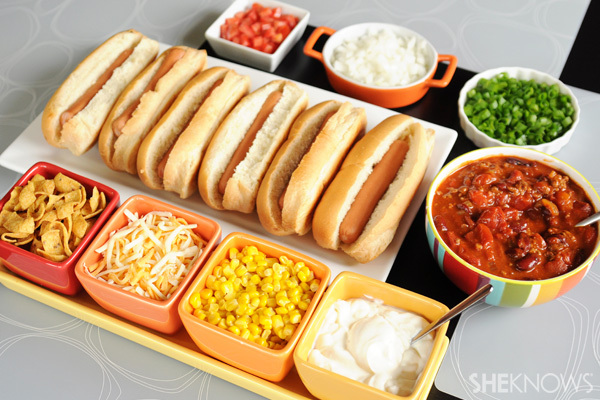 I placed all the toppings on the table surrounding the hot dog platter and chili bowl. 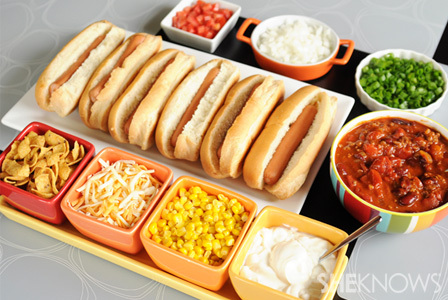 The kids just loved assembling their own chili dog and loved picking out their favorite toppings. 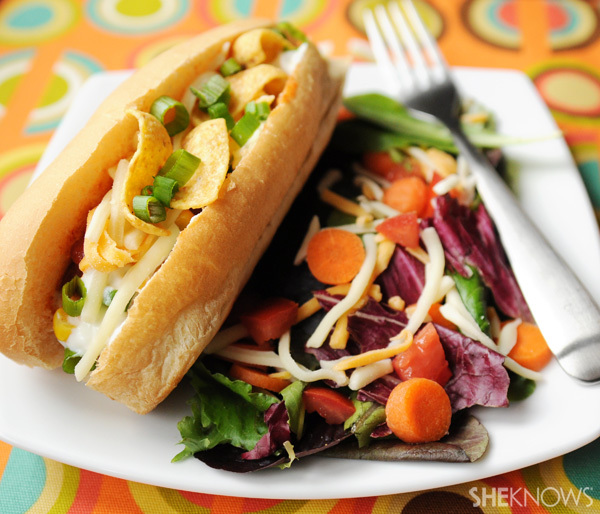 I served our chili dogs with a nice, fresh salad to make the meal just a wee bit more nutritious. This was a fabulous weeknight meal. 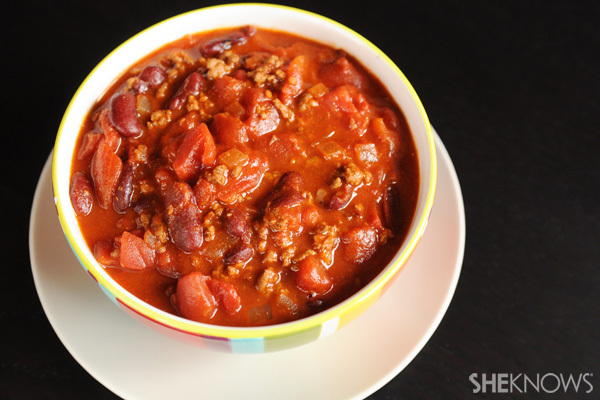 If you make your chili ahead of time, this meal can be brought together very quickly on a busy weeknight. It was easy to make for me and fun for the kids. Definitely a winner and a meal I’ll be making again!